This image won’t really allow you to “search inside”, but if you go to the Amazon book site, you can sneek a peek inside the book before ordering it. Many of my favorite books have been recommended to me by my daughters Kayla, Rebecca and Lydia. 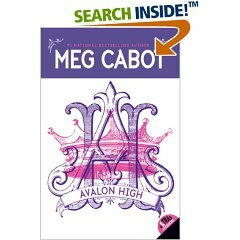 Avalon High, by Meg Cabot, is one of those books. This book is a modern-day morphing of the legend of King Arthur and friends. The book is a fun read, addresses some serious issues (but not in a heavy-handed way), and isn’t predictable, amazingly enough. WARNING: This is not a guy book. 😛 It is not written from Arthur’s point of view, or Merlin’s, or Sir Lancelot’s, so just be warned, OK? This entry was posted on Tuesday, July 31st, 2007 at 9:15 pm	and is filed under Books, Fun Things. You can follow any responses to this entry through the RSS 2.0 feed. Both comments and pings are currently closed.